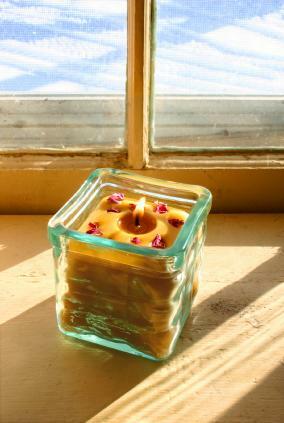 Beeswax candles can become exotic when decorated with dried flowers. Combining beeswax candles and dried flowers gives you the opportunity to create a truly unique candle. No two candles will ever be identical, yet they can add to your décor year round if you use seasonal flowers and ferns. When creating dried flower candles, you embed the flowers by pressing the dried flowers onto the surface of the candle. Then, you dip the whole candle with flowers into clear wax. Another method to create your own dried flower candles is to use a small amount of Stick-um on the flowers and roll the candle gently over them. This can create a unique or different shape as they are pressed into the candle. Using two fingers, gently press the dried flowers down to make a smooth appearance. Pull the candle out, check that the flowers are still pressed flat then dip again for another five seconds. Check the flowers for smoothness and dip one final time for five seconds. Now hang the candle to dry for at least two hours. When the candle is dry and set, you may trim the wick to lighting length. Your beeswax candles and dried flowers project is now ready for presentation. Whether you purchase your dried flowers, potpourri, beads or glitter or dry out your own, this process of making dried flower candles will work with most items that you can press onto the edges of beeswax. As you become more proficient, you might enjoy creating seasonal beeswax candles by rolling pinecones, ivy, fall leaves and even brightly colored summer flowers. Each creation will be unique and makes a great gift. Be sure to exercise caution when working with heated wax and to work in well-ventilated areas with a fire extinguisher handy in case of accident. If you'd rather shop for these unique candle creations instead of making your own, you're in luck. You can find a wealth of vendors on the Internet with beeswax candles and dried flowers creations just for you. EcoChoice Candles -The artist uses handcrafting with flowers, leaves, and ferns to make a 100% beeswax orb. Each one includes unique variations. Bee Glow - Bee Glow creates handcrafted pillars from beeswax to create pure candle art with pressed dried flowers and colored, scented candles. Using colorful beeswax candles with dried flowers can give you another option for creating unique candles.